Mable Frances Pye Davis, 93, of Plymouth died Sunday, March 17, 2019, at Vidant Bertie Hospital in Windsor. Born September 2, 1925 in Edgecombe County she was the daughter of the late Jack Pye and Sallie Spain Pye and was preceded in death by her husband, Lewis Sherwood Davis and son, Lewis Sherwood Davis, Jr.. Mrs. Davis was a homemaker and member of Corinth Free Will Baptist Church. 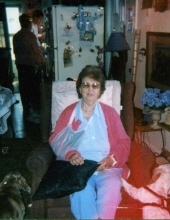 Her family includes her daughter, Hellen Davis Biggs and husband James of Roper, N.C.; son, Johnny Mack Davis and wife Candy of Jamesville, N.C.; sister, Lil Angle of Elizabeth City, N.C.; brother, William Pye of Norfolk, VA.; grandchildren, Richard Davis and wife Darlene and John Brandon. Graveside service will be Tuesday, March 19, 2019 at 2:00 pm at Davis Family Cemetery at Jamesville. "Email Address" would like to share the life celebration of Mable Pye Davis. Click on the "link" to go to share a favorite memory or leave a condolence message for the family.